Ukraine's former Interior Minister Yuri Kravchenko has been found dead at his home, ministry officials have said. Mr Kravchenko had been due to testify on Friday in the case of murdered journalist Georgiy Gongadze. Initial reports say he committed suicide. President Viktor Yushchenko has pledged to find out who abducted and killed Gongadze, who reported on high-profile corruption scandals, five years ago. He said those involved had a choice of testifying or "sentencing themselves". Ukraine's prosecutor general said on Wednesday that investigators knew who had killed Gongadze, but have not made the name public. The discovery of his headless body in a wood near Kiev triggered a political scandal, especially after the emergence of a covertly-recorded tape that allegedly implicated the former President, Leonid Kuchma. In the tapes, Mr Kuchma was heard to complain about Gongadze's reporting and allegedly ordered Mr Kravchenko to "get rid of" the journalist. Mr Kuchma has repeatedly denied the allegations, and says the tapes have been edited to distort his words. But correspondents say it is difficult to see how the case will not now reach him. According to Ukrainian law, the former president has no immunity against criminal prosecution. He is currently on holiday in the Czech Republic, and is expected to return home next week. Communist MPs have called for his arrest. Mr Kravchenko had been summoned to give evidence to prosecutors at 1000 local time (0800 GMT), but was found dead an hour earlier at his home in the exclusive Kiev suburb of Konche Zaspa. He had a gun in his hand, and officials say his death was probably suicide. But several media reports say he had more than one gunshot wound. 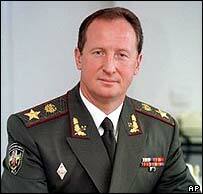 Gongadze's widow, who fled to the US after her husband's murder, said Mr Kravchenko's death was part of a cover-up. There were "too many people from the old regime who would try to conceal the true course of events", she told AP news agency. The former minister had been under surveillance since December and was barred from leaving Ukraine, according to media reports. 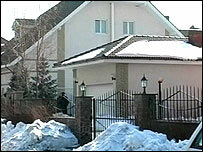 Two of Gongadze's alleged killers are interior ministry policemen who have been detained. A proper investigation into this crime was among the main demands of the pro-Western opposition, which staged the "orange revolution" that brought Mr Yushchenko to power following the disputed elections in November. "Everyone has a choice," he said on Friday. "Either co-operate with the tribunal, the prosecutor, give testimony ... defend your rights and honour. There is a second possibility - sentence yourself."